IT is with great regret that we record the death, on January 28th, at 23, Pelham Crescent, London, S.W.7, of Sir Leopold Halliday Savile, K.C.B. His long and distinguished career as a civil engineer was concerned primarily with dock and harbour engineering, and he made a noteworthy contribution in this sphere. Sir Leopold was born on August 31, 1870, at Ballendrick, Scotland, and he was educated at Marlborough and King's College, London. He served as a pupil under the distinguished engineers, Sir John Wolfe Barry and H. M. Brunel, and whilst with these engineers he was engaged on the new entrance works at the Tyne docks and at the new docks at Barry. This was his first introduction to dock and harbour engineering, to which he devoted practically the whole of his engineering career. In 1896 Sir Leopold went to India, where he assisted in the construction of the Southern Punjab Railway and the Bengal North-Western Railway. On his return to this country in 1898 he gained some further experience of dock work, acting as resident engineer at the Ramsden Dock, Barrow-in-Furness. In 1902 he made his first visit to Australia, reporting on a proposed new harbour at New South Wales; in the following year he prepared a scheme in connection with new harbour works at Singapore. Sir Leopold's varied career took him again to India during 1904, as deputy chief engineer to the Bombay Port Trust, in charge of the construction of the Alexandra Dock. This major project consisted of a wet dock, 50 acres in extent, with berths for seventeen ships, and also included an entrance lock and a dry dock, each 1,000ft in length. He remained in Bombay until 1919, when he was appointed Civil Engineer-in- Chief to the Admiralty in succession to Sir Alexander Gibb. With this new appointment Sir Leopold took charge of all Admiralty dockyards at home and abroad. He was concerned with the maintenance and construction of new Admiralty works which, during the thirteen years he was at the Admiralty, included several outstanding schemes, of which the Singapore Naval Base was probably the most important. One of these schemes, which is of rather particular interest, as it falls outside the normal scope of the dock and harbour engineer's work, concerned the demolition of the German defence works and harbour on the island of Heligoland, which was undertaken after the 1914-18 war. Sir Leopold presented a paper on this subject to the Institution of Civil Engineers (Minutes of Proceedings, Vol. 220, page 55, 1924-25, Part 2), in which he pointed out that the work was believed to be by far the largest one of deliberate demolition ever undertaken, involving harbour works and fortifications which had taken upwards of twenty-five years to construct at a cost of about £35,000,000. A description of the various works on the island, and of the methods of demolition which were employed, was included in the paper. On his retirement from the Admiralty in 1932 Sir Leopold became a partner in the well-known firm of consulting engineers, Sir Alexander Gibb and Partners. During the course of his work with that firm he was concerned with a large number of engineering works, including the Kincardine bridge, Vizagapatan harbour, and extension works at the ports of Rangoon, La Guaira, Venezuela, and Burnie, Tasmania. He also dealt with the civil engineering work for several large thermal power stations, including Ipswich, Littlebrook, Earley, Meaford, and Bromborough. In 1939 the Commonwealth Government of Australia decided to construct a modern dry dock, capable of accommodating the largest capital vessels as well as commercial vessels of the "Queen Mary" class. Sir Leopold Savile visited Australia and investigated sixteen possible sites, with a view to selecting the most suitable for this major work. The site which he recommended and which was eventually adopted was in Sydney harbour, downstream of the harbour bridge and situated between the mainland and Garden Island. His firm was instructed to design the dock and superintend its construction, and later, it was officially opened by the Duke and Duchess of Gloucester in March, 1945, and named the Captain Cook graving dock. This dock, 1,133ft long and 148ft wide, is the largest dry dock in the Southern Hemisphere and entailed the reclamation of over 35 acres between the mainland and Garden Island. Constructional work was commenced in 1940 and completed in 1945, the dock being available for the service of the British Pacific Fleet in the final offensive against Japan. 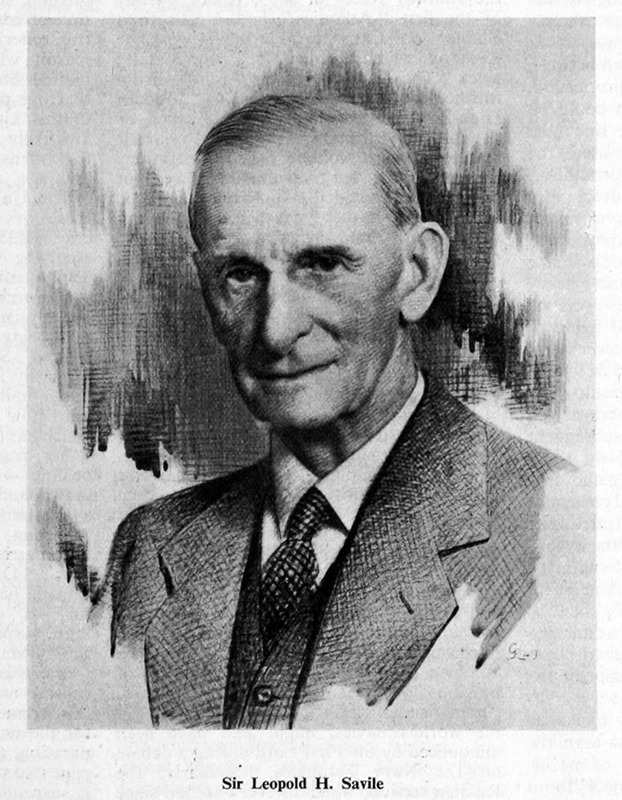 Sir Leopold Savile retired from his partnership in Sir Alexander Gibb and Partners in 1947 and from that date until his death acted as a consultant to the firm, to which his advice on major engineering problems, and especially those concerned with dock and harbour engineering, was of great value. Sir Leopold Savile became an associate member of the Institution of Civil Engineers in 1895, a full member in 1914 and president during the 1940-41 session. He wrote several papers for the Institution and was awarded the Crampton Prize in 1904 and the George Stephenson Gold Medal in 1925 for his paper entitled "Demolition of the Harbour and Defence Works of Heligoland," which is mentioned above. The importance of historical study in engineering is a subject not without topical interest, a study of the history of the development of a particular branch of engineering being indispensable, in some opinions, to a full understanding of the significance of present-day practice. In this respect Sir Leopold Savile's presidential address, delivered on November 6, 1940, is noteworthy. His subject was the ancient harbours of the early Mediterranean civilisations up to the time of the Romans. He described harbours such as those at Tyre and Alexandria, and gave examples of early Grecian and Roman harbours. The address was abstracted in our issue of November 8 and 15, 1940, and contained an authoritative account of some of these old works. Sir Leopold noted that "the similarity of the ancients' treatment of problems to the methods of the modern engineer is in many cases remarkable." "The Egyptians," be noted, "used the cyclopic drystone structure; the Greeks used large ashlar masonry held together by iron dowels and lead; the Romans used their famous, almost everlasting, concrete made of pozzuolana, lime and stone. . . . The Romans were essentially a practical people and they introduced many new methods, among which the most outstanding were the use of the arch, the cofferdam, hydraulic cement (pozzuolana), and the driving of piles in deep water." Sir Leopold was made a C.B. in 1925 and K.C.B. in 1929. Apart from his presidency of the Institution of Civil Engineers, he was an associate of the Institution of Naval Architects and a member of the Institution of Engineers of Australia. This page was last edited on 10 July 2016, at 10:28.